A novelty (for its red color) at Ste. Marie 2016. Isolated crystals and radial clusters of Hutchinsonite crystals that are very bright and well defined, with vivid red reflections. They are on a granular Galena matrix that is partially coated by small and very bright pyritohedral Pyrite crystals and spheroidal Orpiment aggregates. 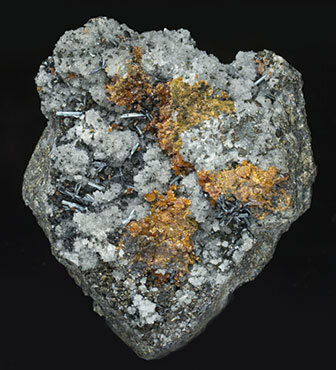 Both the Hutchinsonite and the Galena have been analyzed and we’ll send a copy of the analyses to the buyer. A novelty (for its red color) at Ste. Marie 2016. Isolated crystals and radial clusters of very bright and well-defined Hutchinsonite crystals with vivid red reflections. 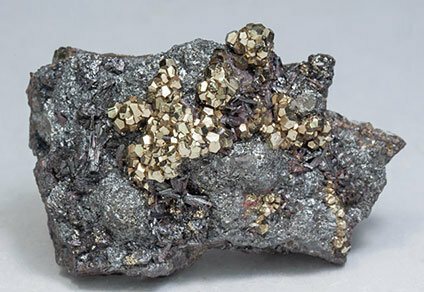 They are on a granular Galena matrix that is partially coated by small and very bright pyritohedral Pyrite crystals and spheroidal Orpiment aggregates. Both the Hutchinsonite and the Galena have been analyzed and we’ll send a copy of the analyses to the buyer. A novelty (for its red color) at Ste. Marie 2016. Isolated crystals and radial clusters of very bright and well-defined Hutchinsonite crystals with vivid red reflections. 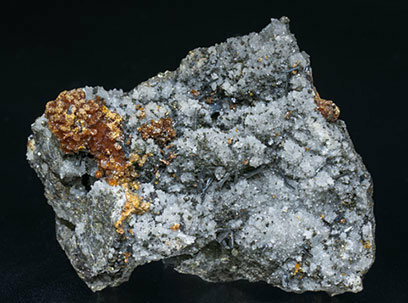 They are on a granular Galena matrix that is partially coated by small and very bright Pyrite crystals and spheroidal Orpiment aggregates. Both the Hutchinsonite and the Galena have been analyzed and we’ll send a copy of the analyses to the buyer. 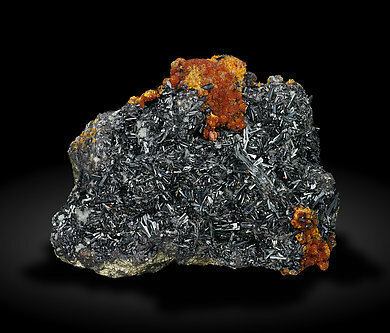 Hutchinsonite is not a common mineral at all. 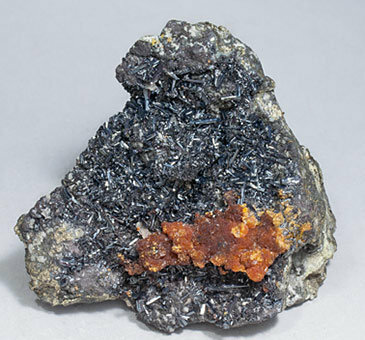 Only in the Quiruvilca Mine hhave good specimens of this rare sulfoarsenide of lead and thallium been found, and although at this time given their relative abundance here it may seem that it is a common species, it is not like that at all. 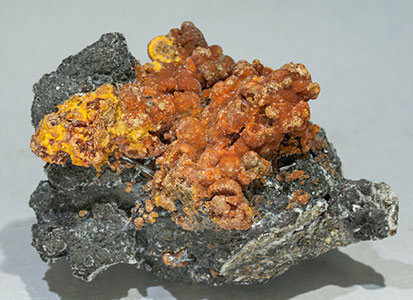 That said, this particular specimen is especially attractive for of the richness of its crystals, its definition and brightness and the contrast with the related Orpiment. 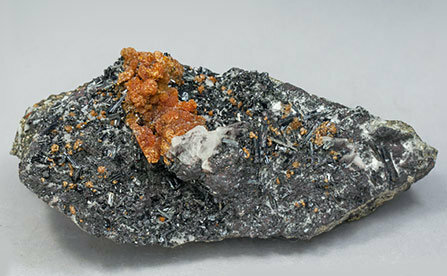 Bundle-like aggregates of Hutchinsonite, a rare sulphoarsenide of thallium and lead, with elongated crystals that have very well defined faces and edges and are very much brighter than usual for the species. They are on matrix, with Orpiment and Quartz. 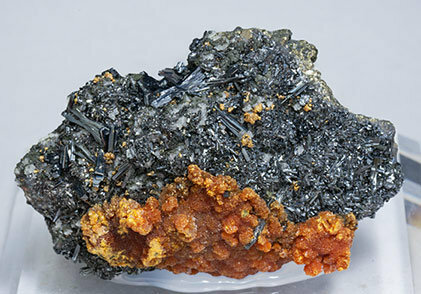 Isolated crystals and bundle-like aggregates of Hutchinsonite, a rare sulphoarsenide of thallium and lead, with elongated crystals that have very well defined faces and edges and are very much brighter than usual for the species. They are on matrix, with Orpiment and Quartz. A novelty (for its red color) at Ste. Marie 2016. Radial clusters of acicular Hutchinsonite crystals that are very bright and well defined and have vivid red reflections. They are on a granular Galena matrix that is partially coated by small and very bright pyritohedral Pyrite crystals. Both the Hutchinsonite and the Galena have been analyzed and we’ll send a copy of the analyses to the buyer. A novelty (for its red color) at Ste. Marie 2016. Radial clusters of very bright and well-defined acicular Hutchinsonite crystals with vivid red reflections. 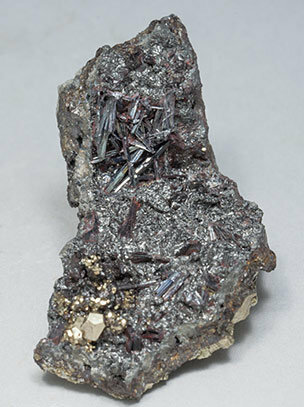 They are on a granular Galena matrix that is partially coated by small and very bright pyritohedral Pyrite crystals. Both the Hutchinsonite and the Galena have been analyzed and we’ll send a copy of the analyses to the buyer.